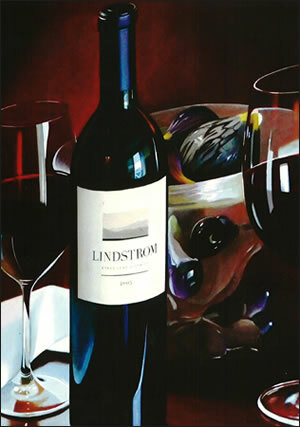 Each year, Lindstrom Wines produces two single vineyard estate-grown wines: a Cabernet Sauvignon, using a selection of the very finest grapes from our four acre hilltop Nicali Vineyard in the heart of the Stags Leap District, and a Pinot Noir produced from carefully sourced grapes grown at the famed Dutton Ranch Russian River Valley. In addition, in select years, the blending process permits Celia the opportunity to produce another wine, skillfully marrying our estate cabernet with Zinfandel sourced from top Napa Valley producers, the Nicali Proprietary Blend. These are truly artisan wines, handmade by acclaimed winemaker, Celia Welch, which are crafted in small lots and specially blended to express the unique characteristics of each vintage.